Villa sleeps six in three bedrooms all with ensuite bathrooms. The villa has its own private pool in a large and secluded patio area with a poolside pergola and additional terrace gardens. The villa is on three levels, the master bedroom on the upper level with own private balcony. On the ground level is the open plan living area with fully equipped kitchen, dining and living areas leading to the pool and patio area. On the lower ground level are two ensuite bedrooms one double and one twin, both with access to the lower garden terrace and patio area. Welcome to our lovely villa! I am from the UK and my husband is from the USA. We are now retired and live in North Carolina. Our careers have taken us all over the world - from Indonesia and North Africa to the Middle East, Asia, Europe and the United States. However, our favourite place to be is still at our lovely villa, with its tremendous view over the bay, yet in close walking distance to the beach, shops and restaurants. We hope that you will enjoy magical Kalkan and the hospitality of the Turkish people as much as we do. With a beautiful view over Kalkan bay in a quiet location a short distance to shops and restaurants, there is plenty of space in our home with privacy spots for all guests.The master bedroom on the top floor has its own balcony facing the bay; the two bedrooms on the lower ground floor access the private gardens. Around the pool there is a large patio, a covered eating area and a poolside pergola for shade. Bedrooms 1 and 2 contain WC, basin, and closed shower unit. Bedroom 3 contains WC, basin, rain shower unit, and jacuzzi. Bathroom has picture window to bedroom. Hairdryer also provided. Ground level - Open plan fully furnished lounge with panoramic views and direct access to pool and terraces. TV and DVD player. Ground Level - Open plan fully fitted kitchen with electric oven and both gas and electric hobs, dishwasher, fridge, cookware and tableware for six. One dining table inside and another on outdoor patio. Notes on accommodation: A beautifully furnished three-bedroom villa with private pool. Air-con/heating units in all rooms. Wireless internet included. Outside: Villa has a large patio area with garden terraces around an infinity pool. A spacious shaded pergola area over the pool provides a relaxing seating area. Gas grill and table on patio for six. 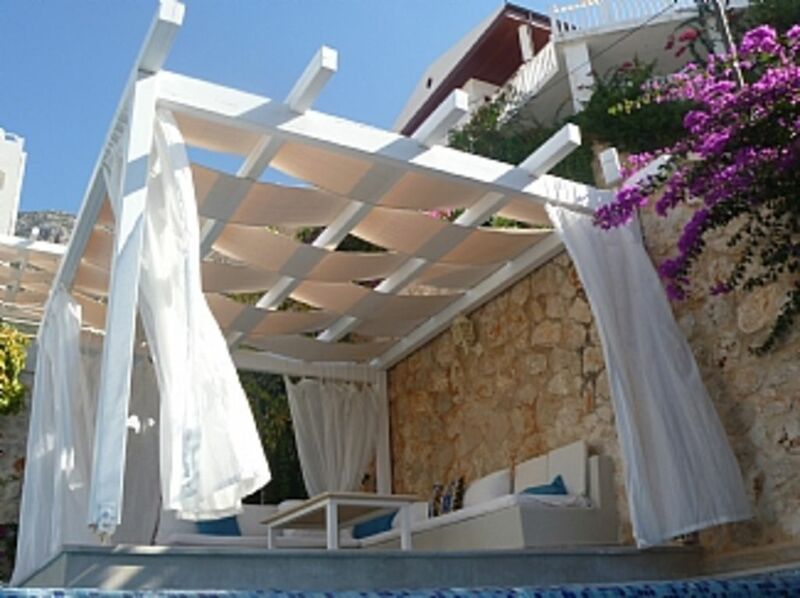 6 sunbeds, 3 large sunshades and Turkish style pool towels are provided. Utility Room: Lower level - WC and basin with washing machine and small storage cupboard containing ironing board and iron. Cleaning / Towels / Linen / Maid service: Rubbish removal, patio cleaning and garden watering, daily. Light house cleaning and linen change weekly. We had a wonderful two weeks in this superb villa which is ideally situated on a beautiful stretch of coastline with easy access to numerous beaches. The villa is well equipped and maintained to an extremely high standard. The pool and outside area overlooking spectacular views of the harbour was perfect and spotlessly cleaned every day by Zeki before we were even awake! We look forward to returning next year. The villa was very clean and tidy and has a fabulous pool with great views. A great outdoor seating area and best wifi i could find. We as a family of Four very much enjoyed our Stay in Kalkan at this lovely villa!, in good location within walking distance of centre, made full use of the Infinity pool on many occasions.Villa is of a very good standard and made for a perfect relaxing holiday, would happily stay here again. We had a fabulous holiday, helped immensely by staying in this wonderful villa. It was extremely well equipped and everything was well maintained and in excellent condition. Everywhere was so clean and the pool and pool area were totally hosed down and cleaned every morning- but at 5ish, so it didn’t affect us at all. The cleaner left the towels in heart shapes, with flower blossoms –which was a lovely touch. We could walk down to everywhere in Kalkan. No car is necessary here. The choice and produce at Carrefore was excellent as were all the restaurants we tried- the best being the Olive Garden. Thank you for taking the time to write this review! I am so glad that you enjoyed your stay at our Patio Villa; and thank you for choosing Turkey and wonderful Kalkan for your family holiday. Villa is a ten to fifteen minute walk to / from the pebble beach in the village. The water in the bay is safe, calm and very clean with no strong currents. 17km away is the village of Patara with its vast sandy beach in a protected area, surrounded by the ancient ruins of the Lycian civilization. In the opposite direction is another sandy beach at Kaputas. Buses provide regular transport to all neighboring villages and places of interest. Dalaman Airport 1hr 30 mins. Antalya 2 hrs 30 mins. Taxi companies based in Kalkan can arrange transportation. in advance. All provide a professional, safe and reliable service. Kalkan is located on the Turkish Mediterranean Riviera, also known as the Turquoise Coast, on the Teke peninsula. It is a beautiful and unspoilt area, known in antiquity as Lycia, where a wealth of well-preserved archeological sites are found. Nearby towns and villages of interest are Kas, Fethiye, Xanthos, Kekova, Salikent; all are within driving distance for daytrips. Many Lycian and Roman archeological sites along this rugged coast are within reach. You can visit Kekova Island, a stunning unspoilt area with hilltop fort along with a magical sunken city. Go to Xanthos, the grand Lycian city with spectacular mosaics, and take a canoe to explore the river. Visit the stunning mountain gorge at Saklikent. Hire a gulet boat for a day and explore the local bays, stop for swimming and snorkeling and at a nearby island for a mudbath, then enjoy a splendid lunch on board. Scuba diving, paragliding, canoeing, horse-riding and rafting are some of the sporting activities available. Please enquire about special rates for two guests only and longer term rentals.